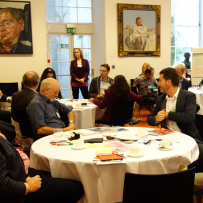 On 16 September CADWAGO organised an learning event in London to discuss the past, current, and future of water governance in the UK. It was hosted at the Royal Society in London. Improving water governance is key to achieving a range of environmental, social and economic objectives including food, water and energy security, climate change resilience, health and well-being, and sustainable economic growth. This symposium brought together examples of initiatives in research, policy and practice for transforming water governance, including: CADWAGO case studies from the UK, Canada and Australia; the OECD’s work on water governance principles; DEFRA’s overview of the Catchment-based Approach; and the work of the Roe Catchment Community Water Management Group in the UK. CADWAGO researchers from the Open University have been working with Government bodies, NGOs, consultants, water industry, academics, and others to better understand the current water governance situation and how it might be improved in practice. The results of this engagement — focusing on transformations in stakes and stakeholding, facilitation, institutions and policies, and knowing and learning — were used as a starting point for developing of an agenda for transforming water governance in the UK and the EU. We would like to thank the participants, who shared their knowledge and experiences in climate change adaptation and water governance, and their organisations for enabling their participation.